Fourth grade is the only grade Heather has not taught! When I met Heather many years ago, she was a fifth-grade teacher, and now she is at the end of another chapter teaching high school English in San Diego, CA, soon to be moving to Wisconsin to begin a new educational opportunity working with CESA-6 and their literacy team. The diversity of her background and experience in education, strong advocacy for students, as well as her support of women, compelled me to have a Coffee Break with her and find out more of what drives this talented teacher, presenter, and advocate for marginalized students. What resources, for example, books, researchers, journals, etc., do you find most supportive of your growth as a literacy educator, and why are they important to you? Right now given the climate in our country and also in our world, I have been using Teaching Tolerance resources more than ever before. The reason that I’m constantly going back to that as a teaching tool is to push on myself as an educator. Personally, I grow and look at things differently after reading articles, looking at lessons, and accessing books and magazines that they promote and suggest. I’m growing personally and I’m able to positively impact the diverse group of students that I work with on a daily basis. We need to address what's happening in our world right now and not shy away from it. I believe that it’s so important and timely to address real-world issues with students who are living those issues. Teaching Tolerance is a very safe resource; it’s age-appropriate and timely. I know you have been a strong advocate for your students in the past. How do you campaign for them now? At the high school level, I’m dealing with students who identify as Trans, and how to come out and ask for different pronoun usage, or starting that journey. I recently received a letter and picture from a student who is in the next step in his journey and starting testosterone. What a celebration that is! Confidence and trust to confide in an adult, and the process of talking through these issues and getting the help they need was a profound moment for me because that’s change right there. He’s finding his own voice and finding his place. I do so much memoir writing with kids, and little pieces were coming out during the process, that I was able to sit with him and say, “Hey, I’m picking up on some things. Is there anything you want to talk to me about?” Then Bam! There was an opening and he took it. So, that’s where I say I’m making a difference. It was a powerful moment. Even though there’s a lot in the news with our LGBTQ kids, and we often talk about them, they are still so underrepresented and silenced in our classrooms and our schools, and that’s a particular group I feel passionately towards, and want to support as best as I can as an ally. 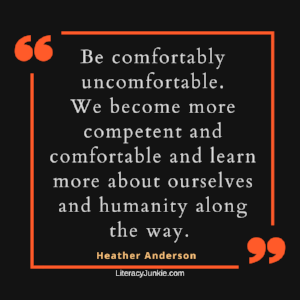 One of my favortie phrases I use with teachers and students is “Be comfortably uncomfortable.” What I mean is it’s very easy for teachers and consultants to recycle the same lessons or the same material. You almost develop a stage presence regardless who you are in front of, and if we don’t continue to comfortably push on ourselves and keep ourselves in a growth mindset, we don’t make change. We are in a field where change is constant. There is nothing constant about education, except that it is constantly changing. We have to be changing and growing as well. 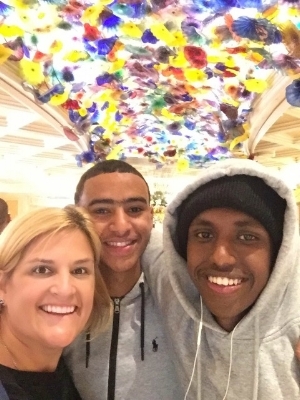 Heather had the pleasure of chaperoning these two young men as they spoke before 3,000 people at a conference in Las Vegas. She says, "Moments like these are priceless." My nugget, my advice, and my personal goal as well, is to constantly be comfortably uncomfortable. Where I can still have difficult conversations, where I can still pick up a book and learn something new, where I can sit down with a student that maybe I don’t know how to start a conversation with, but I do it anyway because I know the end goal is more important than me being uncomfortable in the beginning. I have a responsibility to do that. I also have a responsibility to teach every single student that walks into my classroom as it’s my job to make them comfortably uncomfortable. That is, if we stay comfortable we don’t grow. I like that, too. I’ve also said something similar, which is as educators if we’re not learning, we’re stagnant, and being stagnant equates to going backward. I had to do that myself probably about 5 years into my career when I started to teach upper elementary grades. I was challenged with how to make math accessible to my students. I was uncomfortable with how to teach that content area, so I went back and got my Math Specialist Certification because I recognized and acknowledged that I had an area of weakness, and I needed to strengthen it, and to do so I had to be comfortably uncomfortable. Just keep pushing on ourselves in whatever area it may be, whether it’s having difficult conversations with students or teaching a certain literary device, or whether it is how to talk to kids about what is happening in our government right now. Regardless what the issue is, how do we acknowledge what our strengths and weaknesses are, and then what do we do about it? Being comfortably uncomfortable keeps us moving in the right direction. We become more competent and comfortable and learn more about ourselves and humanity along the way. What do you believe is especially important for educators to understand about literacy? Instill a passion for reading! One way to start, is to find out what kids are passionate about. As teachers, we understand that there’s a set curriculum and that there are classics that we want students to have accessed and read before they go to college. However, what about the changes that are happening in our world, and what is relevant to our students right now? If we don’t tap into what students are passionate about, then we're not going to create, foster and facilitate a passion for literacy. It could be anything, it doesn’t have to be the traditional novel; it could be a blog or a magazine. How do we incorporate technology and interest into a passion for literacy? Again, that’s where we have to push on ourselves as educators; we have to read more, we have to talk to kids about what they’re interested in, and then go and find resources. It’s not easy. I also understand that resources are limited in schools and for teachers, but given technology, we can access materials differently better than we could 15-20 years ago, so let’s tap into that to get kids into topics and issues they want to read. I’m a firm believer that students need to read every day, but also understand the purpose in which they are reading. Given the different content areas, students need to know why are they accessing the literature; what’s the purpose? When students understand why, they're more inclined to engage with the material. Let’s have shorter spouts of reading time for kids with materials they are actually interested in. I’m much more intrigued in that than an extended independent sustained reading time, where kids pretend to read, and they’re doing reading behaviors that they know teachers are looking for, versus actually engaging with the material in front of them, regardless of whether it’s on a cell phone or on a tablet, on a computer, or in print. There are so many different modes of literacy. Are our students truly engaging and thinking about what their reading? Are we allowing students opportunities to talk about their reading? When a kid reads a book they like, it spreads like wildfire. There is momentum behind books when kids talk about them. A few years ago it was the Harry Potter, then the Twilight series, then Thirteen Reasons Why, and now it’s, The Hate You Give. So why aren’t we, as educators, capitalizing on something that is interesting to kids and that kids are promoting? Of course, we must read the books ourselves to know what our students are talking about to get the momentum further in the schools. Talking about our reading lives needs to happen more frequently, and we also have to be prepared for those students who state, “I don’t like reading. It’s not something I choose to do.” They need to understand the different variety and purposes of reading, and find a way to get them started. That’s where looking at shorter bouts of more meaningful and purposeful reading, I believe, should be a focus in schools. How do you ensure all students are learning? This is a constant struggle for me because I know that I’m dealing with human beings. Every day they walk in with something different. They have a different attitude, they’ve had a different experience from the day before. They could be going through a break-up, maybe they didn’t eat breakfast, or they could have had an argument with whoever has dropped them off at school. I have to recognize that it changes, and taking that into consideration I look at varying ways of accessing learning. It could be through observations, or conversations directly through students, assessing their written work. As an English teacher, I’m able to get writing samples pretty frequently from students whether they are exit slips to more formalized essays, and through that, I have to make sure I am looking for something specific. We can become overwhelmed by the mechanics of writing, and that has changed so much with technology with autocorrect and spell check, so when they write a piece by hand, I can’t get hung up on the mechanics. Working in a diverse community allows me to be the learner every day. I embrace the moments when my students teach me their cultures, languages and share who they are beyond the classroom. When analyzing a piece of work or having a conversation with a student, I have to go back to my purpose and stay focused on the goal. That helps ensure every student is learning. My goal is that every student walks out of my classroom every day has changed or grown in some way, whether it is personal and or academic. Knowing what is happening in their lives helps me be a better teacher, a better mentor, and a better assessor of where they are at in their learning progression. Right! And I’m going to be here to help you through it. That’s where Drs. Doug Fisher and Nancy Frey’s work comes into play with the Gradual Release of Responsibility (GRR). If GRR is truly in effect in a classroom the trust is built because students are receiving the supports throughout the learning that they need in order to get independence. If the teacher is truly modeling, if the teacher is designing opportunities for guided and collaborative instruction, then it transfers into the independent assessment and application, then students will understand. It doesn’t have to be in that order, obviously. Tell me who’s on your guest list for a dinner party your hosting for literary heroes (authors or educators, dead or alive), who would you invite and why? The very first person that came to mind is my second-grade teacher, Mrs. Ruby Gordo, but unfortunately, she’s no longer with us. Mrs. Gordon was my first educator who inspired me to be a teacher. I remember her read alouds were magic! I was that kid who would rush in from recess and want to sit right in front of her and admire her matching sweaters and skirts. She was wonderful! When she read, I got lost in her many voices, and intonation, which helped instill a love of story in me. From a young age, I knew books were important to me. She understood the value of reading to children. I would want her to know how much she inspired me to be the teacher I am today because a lot of what I do stems from her influence on me. My other influence as far as becoming a teacher was Karen Wroblewski, who I had as my 10th and 12th grade English teacher in the International Baccalaureate Program at San Diego High. She pushed me to be the best writer I could be to really find my voice as a writer and as a person. She had me read The Handmaid’s Tale, and as a result of reading that book, I would invite Margaret Atwood to the table. I would talk to Margaret about the connections and parallels between The Handmaid’s Tale and what we are seeing right now in our world. I would be fascinated to see Karen Wroblewski and Margaret and everyone discuss that book, and what we can do as women to move forward and push through difficult times, and help women be the best that they can possibly be. That leads me to Nora Zeale-Hurston and her book, Their Eyes Were Watching God, which I was heavily influenced by, as far as a woman overcoming struggles and obstacles in her life, and being okay with who she is in a time when it was uncommon, and expectations were placed upon you. She overcame that in her story. For me, Nora Zeale-Hurston is writing to us right now as a generation of women who are struggling with those same issues. How collectively, can we find a common voice and a common goal for ourselves as a woman in our world? I would definitely have to include Maya Angelou, who is the epitome of strength and perseverance. Her words inspire, teach, motivate, and educate. 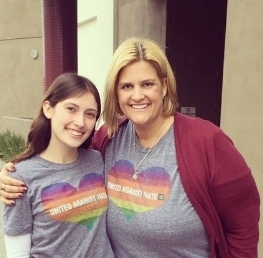 She is somebody who has impacted so many people in our world, and I would love to sit down and hear her words of wisdom about moving forward as a person, as an educator, and as a woman. And of course, my mother, a strong female role model and. She is not only my personal educator every day, but she was an educator of thousands of young people all throughout her teaching career. She has influenced me all through my life. So that’s my powerhouse table of women who have made a huge impact on who I am and who I will be. Before we go, is there anything else that you would like add that we didn’t talk about or to impart to other educators? Finding the balance between taking care of the children who walk through your door, but also taking care of yourself as a person. It is easy to give too much of ourselves because we are in a selfless profession. We don’t replenish our tanks. After twenty years in the profession, I am really recognizing the importance of self-care physically and emotionally. I wish part of coaching, mentoring and leadership dealt with self-care. I strongly believe it’s a piece of our profession that we need to focus on to help our incoming and established educators. Bio: Heather has had many diverse K-12 experiences from elementary teacher, to Math Specialist, to teaching high school and middle school English, a Literacy Resource Specialist, and a Spanish instructor, all of which has led her to amazing opportunities to present Nationally and Internationally, and become a published author. She is a strong believer in lifelong learning, and holds additional certification in Leading Edge Certified Blended Learning Teacher, Restorative Practice, and Water Aerobics. Heather embarks on a new journey, leaving behind her beloved San Diego in June to move to Wisconsin and join CESA 6, as a member of their literacy team.